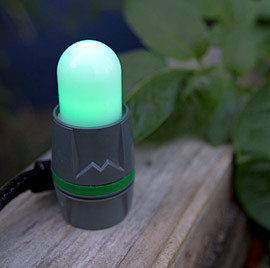 The name sounds like a kid’s toy, but these are mil-spec modular lighting tools that are waterproof, flexible, and powered by watch batteries (which can be treated as hazardous waste, for proper disposal). Lazerbrites have two components: heads, which contain LED lights, and tubes, which diffuse the light given off. Two heads can be attached to each tube, the LEDs oriented towards the inside of the tube, and tubes make the illumination omnidirectional. You can even use just a head and a little dome, LED facing outwards, for something even smaller. Or combine them, even with two different colors in the same tube. Their “multi-lux” heads have low, high, and flash settings. They are also much brighter than glowsticks; I stick mine inside my storm cag to cut down the brightness when on night paddles. This also helps me look like a huge radioactive orange cloud at night. Stylin’. What’s great about this modular system is that a single Lazerbrite unit – let’s say two heads, a tube, and an accessory or two – can be used for an insane amount of things in a camping or kayaking context. The general build quality is excellent. In my own testing, they are indeed waterproof, surviving salt water splashes and capsizes. (As with all “waterproof” devices, rinsing them in fresh water is critical.) While I could see a tube cracking if stepped on against stone or concrete, dropping them on rocks doesn’t seem to phase them much. The head design is clearly made for operation with gloves. Even with thick neoprene paddling mitts, switching the heads on and off and to various settings is a snap. Every head has a mounting loop for threading a lanyard. There are six rotary positions for each head: Low, Medium, Flash, and an Off position between each one. The modes have clever graphical marks molded into the plastic, but these are impossible to see at night and cannot be recognized via touch through gloves; one wonders if actual raised pips, like braille, would have been better sensed via touch. The six detents for these positions offer very firm, positive haptic feedback for the user. Lazerbrite’s use of CR-2032 lithium batteries makes bringing along extra batteries extremely space-efficient comapred to cylindrical batteries. We kayakers appreciate the benefits of low-volume everything! Ironically, size is one of the drawbacks of Lazerbrites themselves. A full unit (2 heads and a tube) is roughly equivalent of 2 glowsticks in girth, and about the same length as a single glowstick. 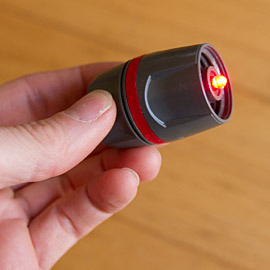 Be prepared to be asked if that’s a Lazerbrite in your pocket or if you’re happy to see someone. For all their flexibility, Lazerbrites are not as convenient as a headlamp for task lighting or on-land navigation, as they’re not hands-free, and the light throw from the central tube isn’t great. For night paddling, they could sometimes even be dimmer to be more useful, but there are many ways to attenuate the light output if you’re clever about it (and they sell an adjustable shroud to do just that). However, one needs to remember what these are for: They’re for being seen or brightening up a small nearby area. Carrying one headlamp and one Lazerbrite dual-head tube (with, say, a red and a white head) makes for an incredibly flexible lighting package that can meet nearly all your needs on any sort of kayak excursion or expedition. Personally, I carry a Petzl e+Lite headlamp and a red/white Lazerbrite multi-lux unit when kayak camping, so I have the option of brighter white light or night-vision-saving red light for any purpose…and they even take the same kinds of batteries. They’re definitely great for in-tent use, marking for others, and reading charts and maps (due to their omnidirectional light spill). Lazerbrites are specialty items, sturdily constructed, American-made…and priced as such. They’re definitely not cheap. You could probably buy as many disposable glowsticks as you’d need for years for the price of one Lazerbrite package. But you’ll be burying all those glowsticks in someone’s backyard before your Lazerbrite fails on you, if it ever does. Price aside, though, Lazerbrites are a good value, owing to their flexibility, ruggedness, and less-heinous long-term environmental footprint.